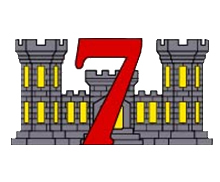 The 7th Engineer Support Battalion (7th ESB) is an engineering support unit of the United States Marine Corps and is headquartered at Marine Corps Base Camp Pendleton, California. The unit falls under the command of 1st Marine Logistics Group and the I Marine Expeditionary Force. Provide general engineering support of an expeditionary nature to the Marine Expeditionary Force (MEF), to include mobility, counter mobility and survivability enhancements, Explosive Ordnance Disposal (EOD), and general supply support to include the handling, storage and distribution of bulk water and fuel. 7th ESB provided engineering support to the 6th Marine Regiment throughout the initial breach of the Taliban stronghold of Marjah in the Helmand province Afghanistan during Operation Moshtarak in early 2010.